I was quite impressed with the debut but this one just blows that out of the water! Formed as long ago as 2001, it took Gothenburg-based quartet Manimal the best part of a decade to issue their debut album – 2009's 'The Darkest Room' – so I suppose it shouldn't really come as a surprise that sophomore album 'Trapped In The Shadows' took almost as long. Back in the good old days (unless you were Boston or Def Leppard of course) such a protracted gap between releases would almost certainly have led to the band's demise; fortunately, such rules seem to have been thrown out of the window in this post download age. Impressing straight out of the box with their mix of Progressive moods and sounds a la Queensrÿche and Nocturnal Rites, the aforementioned debut was certainly one of the better releases of that year, and when similar lists for 2015 come to be compiled shortly, I'm fairly confident that 'Trapped In The Shadows' will once again feature prominently. 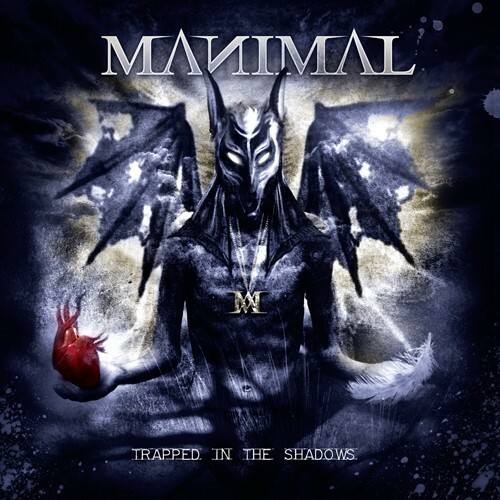 A little straighter than its predecessor (although there's still a modicum of Progressive flair on display), this latest release sees Manimal opt for a riff heavy attack that reminds me of 'Painkiller' era Judas Priest mixed in with Queensrÿche and Crimson Glory. I have to congratulate vocalist Samuel Nyman because last time round I thought he was the weakest link in the band, but on the evidence before me here, he seems to have come on in leaps and bounds – very Rob Halford meets Midnite! Most of the tracks are in that punchy four to five minute bracket, yet despite the dominance of those thunderous drum/bass runs and a profusion of searing riffs, the melodies are just as strong as (if not stronger than) ever. The customary slow burning intro of opener 'Irresistible' eventually gives way to one of the best early Savatage riffs I've heard in years and comes complete with sky skimming vocals a la Halford circa the aforementioned 'Painkiller'...spookily, the second time that comparison has struck me right between the eyes in as many days (see Primal Fear review HERE). And just as you've picked your jaw up from off the floor, along comes 'March Of Madness' with its unmistakably classic Queensrÿche vibe... two songs in and I'm already sold! And it just gets better and better... 'Screaming Out', the juggernaut heavy title track (very debut album from CG), 'The Dark', 'Silent Messiah'...all razor sharp and deadly.